Human beings are of the natural world, and like the natural world, you have rhythms and cycles. To honor the rhythm and cycles of life is to honor the life within you. You may have experienced disconnect from the natural world, and by setting aside time to realign yourself with these patterns, you will restore harmony and ease to your constitution. This time of the year, is recognized by many traditions a time when the veils are thin and the access to your ancestors and the realms beyond are more easily reached. It is a great time for spiritual understanding; and ancestral support and guidance. 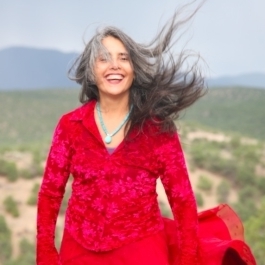 Your week of respite will be guided by the presence-filled shamanic guide Visudha de los Santos in personal inquiry, movement practice, 5Rhythms movement, meditation, ritual and ceremony; nature-based exploration and personal healing. Being guided by the principle that the body always knows, from its innate wisdom, recognize that you have much potential for personal growth within, and that your own authentic self desires to be seen and shared. Your week will include a traditional Chunnupa (prayer) ceremony; and an Inipi (Sweatlodge) ceremony of the Lakota Native American tradition. Please note that the lodge can be quite strenuous, and it is contraindicated for several conditions: Menstration, high blood pressure, pregnancy. You may elect to participate in the retreat, and still learn the lessons of the Inipi; and sit out during this portion of the retreat.